Many U.S. lawmakers, including some of President Donald Trump's fellow Republicans, have rejected Trump's embrace of Saudi Arabia. 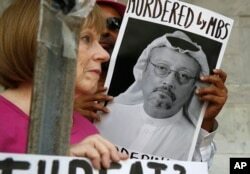 They have called for a strong U.S. response to the murder of prominent Saudi journalist Jamal Khashoggi, and the war in Yemen, which has created one of the world's most urgent humanitarian disasters. A Senate aide said Haspel is not scheduled to be involved in Wednesday's briefing, which will take place at 11 a.m. EST (1600 GMT). A House of Representatives aide said no similar briefing had been scheduled in that chamber.